Scientists have discovered what drives some monkey mothers to give in to their babies' tantrums. 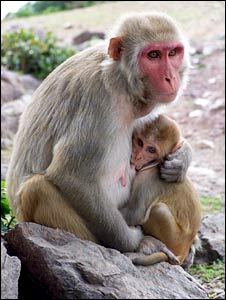 A study of rhesus macaques revealed that females were more likely to feed their bawling babies if irritated bystanders lurked nearby. The study was carried out in Cayo Santiago, an island off the coast of Puerto Rico. Stuart Semple, a primatologist from Roehampton University in London who carried out the research, said: "The baby monkeys' cries are high-pitched, grating and nasty to listen to - not just to their mother but to animals nearby. "And we found that the way mothers respond to their crying infants is affected by who is around them at the time." 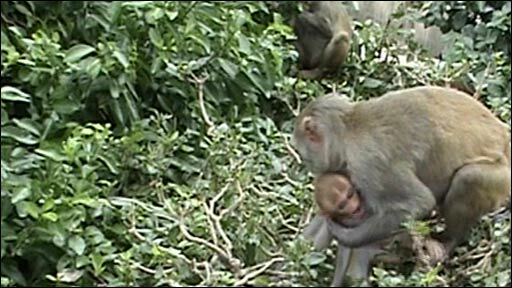 The researchers discovered that females were twice as likely to respond to their infants by feeding them in the presence of aggressive males or more dominant females than when in the company of less dominant or closely related monkeys. Further study of the population revealed that although attacks were rare, mothers and infants were more than 30 times more likely to face aggressive behaviour from angry onlookers when a baby was crying than if the baby was content. Dr Semple explained: "The mothers seem quite reluctant to give in to their infants, but when there are big dominant animals around that pose a threat to either them or their infants, their hand is then forced - they have to give in to their infants' cries." The researchers added that while there had been no directly comparable studies carried out on humans, some anecdotal reports suggested that human mothers were more likely to acquiesce to a screaming child if faced with irritated onlookers. Dr Semple told the BBC: "When I tell any parents of young children about this research, they get it immediately - they've felt this kind of bystander effect when their own offspring is having a public tantrum."